In keeping with its commitment to deliver the advanced in precision ag technology, Case IH is currently working to enhance the capabilities of its technology to allow for remote diagnostics and allow systems to be serviced over the wireless internet. "Remote diagnostics is the next step in precision ag and we hope to be the leader in this field,” said Case IH Advanced Farming Systems Brand Manager, Guiseppe Cuteri. Remote diagnostic technology will eventually allow for precision ag components to be serviced through wireless technology, so there will be no need for technicians to travel should the system need maintaining or upgrading. For farmers, this means immediate and fast diagnosis of any issues and easy access to system upgrades. 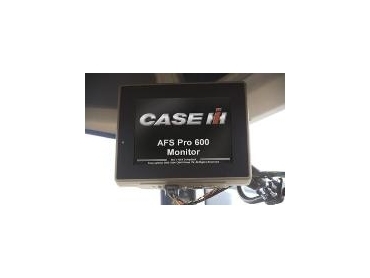 Case IH has recently released the AFS Pro 600 colour touch screen monitor, which provides control of machine settings, guidance, data logging, mapping and virtual terminal applications for implements. The AFS Pro 600 colour touch screen monitor provides a common link between Case IH tractor, harvesting, implement and sprayer products and its portability between these product platforms reduces system complexity, allowing farmers to easily process the application data gathered. “After three years in development, the AFS system colour monitor has only just been released but in keeping with our commitment to continually deliver smarter farming systems, we're already working on the next stage,” explained Guiseppe Cuteri. The AFS600 is currently available for use on the Case IH Magnum and Steiger tractor range and across the Axial-Flow range of combines. “We’re also working on expanding the system for suitability across other product lines and in the next two years, farmers will be able to use the system on the Case IH range of SPX Sprayers and Flexi-Coil air seeders,” Guiseppe Cuteri said.